Nicely separated wooden huts scattered among the trees on a gentle incline overlooking the hills on the other side of a valley give this place a sense of privacy, and adventure, that you just won’t find anywhere else. 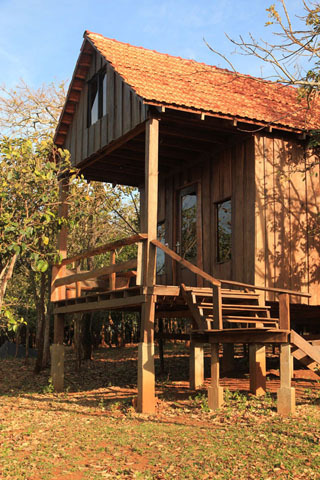 The Nature Lodge is Sen Monorom’s most popular hotel, run by an Israeli-Khmer couple with a good grasp on what makes the backpacker set tick. Average rating 7.8 from 293 reviews. The bungalows are set in a fenced-in field with horses, cattle, and dogs running free on the premises. It’s all rather like going to Camp Cambodia. This is one of two or three places in Mondulkiri with something approximating a lively bar atmosphere, including a pool table and a rotating selection of generally convivial fellow-travellers. There are even musical instruments for people to get tucked in to, should the mood so take them. Social types and those traveling with children will appreciate the welcoming atmosphere. The attached restaurant has the most extensive Western menu in the province, with a good selection of sandwiches, Asian dishes, burgers, Israeli meals, and desserts, The owners can arrange treks, excursions to nearby waterfalls, and transport to and from Phnom Penh and elsewhere in the region. They are associated with L.E.A.F. Cambodia’s Mondulkiri Elephant & Wildlife Sanctuary, which has an extremely good reputation. Rooms are simple cabin-style accommodations, and come in a range of sizes. Come here expecting a close to nature experience instead of all the mod-cons, and you’ll have a good time -- and there are hot showers. All the rooms have electrical outlets, while WiFi is available in the main eating and reception area. Families and groups will be interested in the larger lodges and cabins. Note that if you’re sharing accommodation, the attached bathrooms in the smaller bungalows have a wholly inadequate-for-privacy curtain in lieu of a door. Check rates at Nature Lodge on Booking.com.